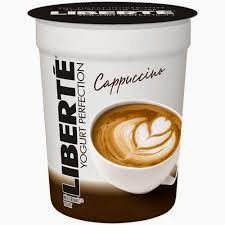 Have you ever heard of or tried Liberte Mediterranee yogurt before? I was introduced to it from a friend almost two years ago and I have been completely hooked ever since. My friends and family often call me a food snob for good reason, this yogurt is premium perfection that exceeds my standards. I have tried almost all of the flavors except the two newest ones: Caramel and Cappuccino. I have been stalking my local Publix supermarket in hopes they will start to carry them. In the meantime, my all-time favorite is the coconut flavor. The first time I tried it I had a moment. I closed my eyes and felt like I was eating freshly grated coconut mixed into the creamiest, richest yogurt I ever tasted. It was absolutely divine! It's made with whole milk and has no artificial sweeteners or preservatives. I have converted many yogurt lovers into Liberte Yogurt lovers. I mostly enjoy my yogurt as is, but on occasion I will add some granola on top for breakfast. Another yummy way to take my Yogurt Perfection to the next level is with one of my favorite Liberte recipes, a fabulous fruit smoothie. I take my favorite fresh and frozen fruits, ice cubes and a container of Liberte Mediterranee and blend it into the most gorgeous (yes, gorgeous) smoothie ever! Giveaway is open to US Residents only and will end on February 25, 2015. One winner will be chosen at random and will be contacted via email to be awarded prize. Good luck! I would like to try Liberte Yogurt's Méditerranée Blueberry flavor. I want to try the Cappuccino or the blackberry flavors. I am most excited to try coconut flavor. I want to try Coconut! Think I might like to try the coconut, so will have to check in my store. I have tried this brand of yogurt before and it is so delicious! My favorite flavor is the Méditerranée Caramel! There are live, active cultures in this yogurt and there is no added gelatin, sugar substitutes or preservatives.This makes this a high quality yogurt! I would love to try the coconut, it sounds great. Oh I would love to try the Méditerranée Blackberry! I learned that Liberte only uses suppliers that provide milk from cows not treated with rBST/rBGH! This is great to know! I would like to try the coconut flavor. I learned that Liberte was founded in 1936. Méditerranée Caramel flavor is one that looks yummy! Definitely the Cappuccino would be my favorite flavor! Sounds so good. They use whole milk cream to make this yogurt! I'd like to try the Caramel flavor. Yum! I'm really excited to try the cappacino one and the caramel one, so unique! I want to try the peach and passion fruit flavor. I learned that they sell this yogurt at Safeway! The company's home town is Montreal, Canada, they have a caramel flavor! I would like the Caramel flavor. I learned that their products are not made with any ingredients that contain gluten. There are no gelatin, sugar substitutes or preservatives! There are nine captivating flavors of these yoghurts! i want to try the caramel flavor! This yogurt with whole milk yogurt is in nine captivating flavors. I learned they have a flavor called Méditerranée Peach and Passion Fruit, sounds yummy! I want to try Méditerranée Blueberry. I learned that they refrain from adding gelatin, sugar substitutes or preservatives. My flavor would definitely be blueberry. It is amazing. I really want to try the caramel though. I learned WWI, Liberte was bought to feed the troops. I learned that until 1964 they had been producing mostly cheese, and then began crafting yogurt! I want to try the Méditerranée Caramel. We are all about some caramel here. I'd love to try the coconut flavor! I learned that liberte's first factory still stands though it is now trendy coffee shop. I would love to try the caramel! I would love to try the Peach Passionfruit variety. I learned that it was founded in 1936 and it started in a small kosher dairy. I really want to try the Caramel.